If you have been searching the web for baby products that you can fall in love with, chances are good you have seen the Lotus Travel Crib. The reason for this is simple; Lotus designs items that make it easy to travel with a little one. It does not matter whether you are traveling to Grandma’s house or across the country to stay in a motel on vacation. Unsure if you should consider it? Check out our Lotus Bassinet review to find out more about this extremely versatile brand of bassinets, play yards, and travel cribs. Most bassinets are too bulky to be easy to carry along on adventures outside of the home. Most of them do not fold up or fit inside of a storage container the way that the Lotus does. Travel cribs are still rather large cribs that are difficult to carry if you must travel via a plane. Playards are the same way. Many of them are playpens that are designed in a way that allows them to fold up flat, but not fold up small. Lotus products fold up small. 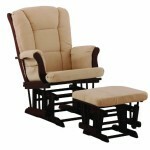 They are designed for traveling, but they are comfortable enough to allow you to use them without worry when at home. The Guava family Lotus crib folds up small enough to be carried in a large shoebox if you are going to choose the bassinet style crib. 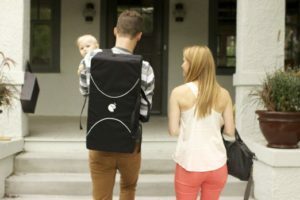 The playard can be worn on vacation as a backpack and parents love it. In the past, having a baby meant you had to practically move from one house to another to ensure your baby had a comfortable and safe place when on vacation. The Lotus travel crib and portable baby playard changed everything. Parents love how safe their child is while they are playing in the crib or sleeping. They love how easy it is to carry with them on their travels and some state that it does work as a carry on when they are traveling on a plane. They enjoy how easy it is to set up the Lotus travel crib and take down. In an effort to help you choose the best one available, we are going to tell you about our most favorite options. These are all highly rated and loved by the parents who use them. What more could you hope to find? A crib or a bassinet is a beautiful piece of furniture, but some people want something more than lace or wood. They want to create a space that is fit for a little prince or princess. This is why there are now round cribs available and most parents love having them in their nursery. You may want to consider checking out round baby cribs for sale. Why Use a Round Baby Crib? 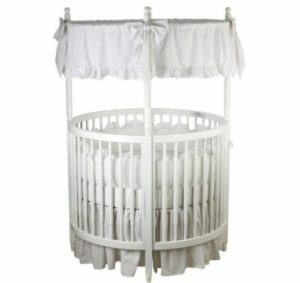 Round cribs are smaller than the standard rectangle style cribs. This makes them ideal for putting in a parent’s room where space may be limited and nurseries that may feel cluttered by a huge crib. They are also usable if you want to create a unique princess style room. 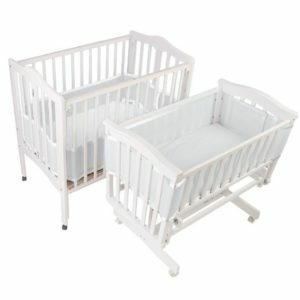 These cribs are portable and can be used anywhere to keep your baby close by. However, some do not fit through doorways when fully put together. Therefore, you are somewhat limited in terms of portability depending on the crib of your choice. Round cribs were once considered very expensive by most families. They are unique and unique often means pricey. Now it is possible to purchase round baby cribs cheap, so many parents feel that they may not be safe. The truth is, as long as you pay attention to the weight and age limit on the crib, you will be putting your little one into a crib that is extremely safe and comfortable. 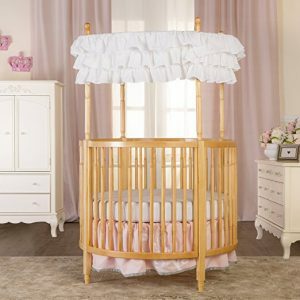 For parents who want their little girl to feel like a princess when she is in her bassinet, these cribs are ideal because most of them offer a canopy cover that looks as cute as your new baby. 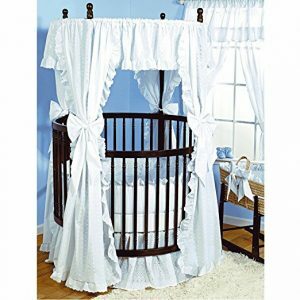 It is a crib style that looks more old-fashioned than modern, which suits the princess or prince theme better than all other cribs. To help you gain a better understanding of what is available, its price, and other things, you should check out our reviews for our most favorite round crib sets. 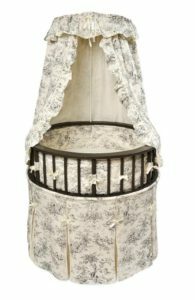 This beautiful bassinet features the black Toile pattern. 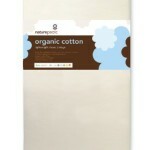 The bedding itself is made with a polyester/cotton blend of materials. The set ties to your round crib to make it look even more feminine and perfect for your little princess. The canopy on top accents the overall feel perfect and it is priced very affordably at around $140. This round crib is very sleek in design. It is black with gold accents, which makes it great for a prince/princess. The crib has a drop-down side to make picking up your little one easier. Everything is USA made. This is a white crib that will cost you just under $400. 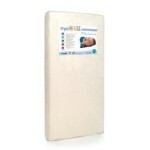 It is made using solid wood and provides you with 4 mattress height positions. This crib can be used safely by a child until they reach 40 pounds and meets all US safety standards to prove it. If you want a white crib set that features a canopy for your princess, you may love the carnation eyelet set. The crib itself is dark brown wood. All fabric on it is white. It is a bedding set that is made in the USA and comes with everything you need for a price of roughly $265. 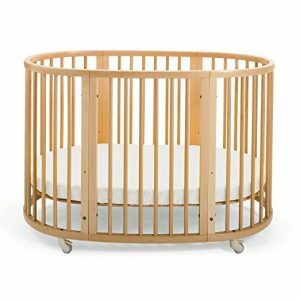 This circular crib is ideal for a little princess. You can choose from natural or cherry in color. It does have a canopy and a non-drop side rail. However, even though the sides do not come down, it is still going to be easy for you to put your little one in and get them out since it has a 4-position mattress platform. The mattress is sold separately, but it does come with all required tools for assembly. This crib is oval in shape. It is available in white, natural, or cherry. 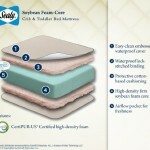 It is a convertible crib that can be used from birth through age 10. It is small enough to fit through the average doorway and has four height adjustments. This crib is made of solid Beechwood to ensure you have a crib that will last through the years. 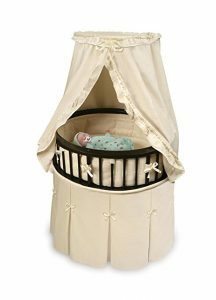 This beautiful bassinet is ideal for both the young prince and the beautiful princess. 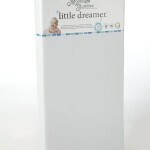 It includes everything you need to set it up including the bedding and bassinet. Behind the skirt, there is also a storage shelf for you to put the necessities. It does have wheels so you can move it from room to room. The color is espresso wood and ecru on the waffle bedding. 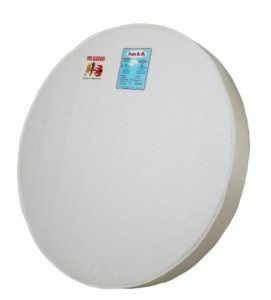 If you have the frame, you may need to purchase a new round crib mattress. This mattress is affordably priced around $75. It is safe for baby and meets all safety requirements. 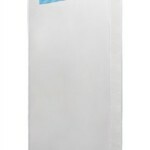 This does include the fact that it is flame resistant and free of lead or other toxic chemicals. There is no denying that there are a lot of people who love the camo style and incorporate it into as many areas of their life as they can. 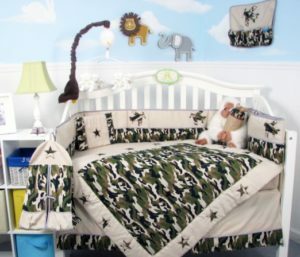 Many families choose to add camo to a baby’s nursery. It is a cute style with a lot of potential ideas to make it a great nursery to grow up in. It works to create a unique nursery that is different from what other people in your family may have tried out. The hard part, until recently, was the crib. 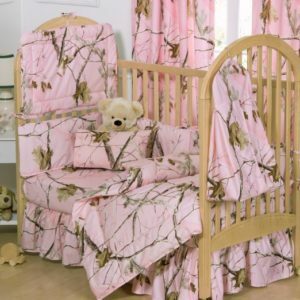 There were not very many options for camo baby bedding sets. That is about to change and it will add that extra something special to any nursery. Camo is a popular style for both hunters and military families. There is something unique about the style that appeals to everyone and when creating a nursery, there is no exception. 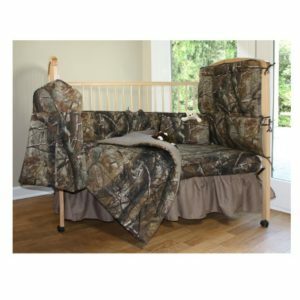 Even families that have no particular fondness for hunting can find unique and creative decor ideas using camo. There are camouflage high chairs, rocking chairs, and wall decor that you can add to any baby’s room to make it cute and fun. There are coat racks that feature deer, moose, and teddy bear heads, imitation trees that never need watering, and plaques that proclaim your little one is, “Daddy’s Little Huntin’ Buddy”. If you are welcoming a little girl to the house, there is no reason that you have to sacrifice the camo. 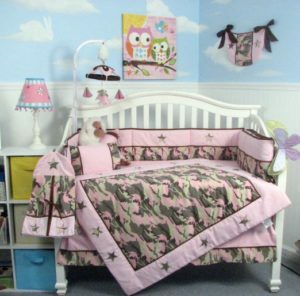 There are plenty of options for little girl camouflage items, including wall art and pink camo baby bedding. You can add clouds to the wall to create an outdoor environment or ABC photos that stand for Antlers, Bows, and Camo. The idea behind creating a camo nursery is rustic and casual. You should stick with earth tones and wooden items if you want to make it a perfect space. 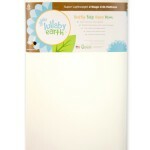 Add the curtains, add the decor, and do not miss out on the little extra bonus of crib sheets for your baby’s bedroom. You just have to look around and decide on the camo baby room ideas that you like the most. From there, you can create a world that is as special as your little one. When creating a camo baby room, you have a lot to consider. If you are able to build your own crib out of wood, you are very lucky because finding a wooden crib is not always easy. Most cribs are painted an unnatural color and some do not even look like wood. 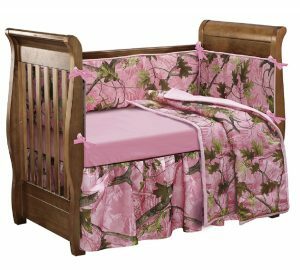 Admit it; a bright white crib with blue, pink, or white sheets would not look excellent next to green camo. That is why you need a lot of camouflage baby gear to fill it with. Crib sheets can bring it to life. We know that everyone loves a little camo. For this reason, we have searched and found some of the best crib bedding sets available for babies. Perhaps you if you love camo, you will love what we have discovered. Crib safety is something that concerns every parent of a newborn baby and it does not stop until the child is able to get out of the crib and into a real bed. Parents do not want children to sleep on a crib mattress that is too soft or have their little one get stuck in the railing of the crib. That is why people often choose to put a crib bumper around the crib. The thing is, many people prefer to go with a breathable mesh crib bumper instead of the traditional padded bumper. Which will you choose? Read everything there is to know about crib bumpers to find the best match for your little one. 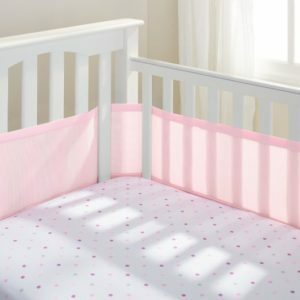 A crib bumper is traditionally a padded material that wraps around the crib. It is not considered safe because many children have become entangled in them. The new bumpers can be secured by wrapping it through the slats in the crib or tying it off to the crib rails. Its purpose is to protect little ones from getting arms or legs from getting stuck in the crib rails and eliminates the possibility of your little one bumping their head while they sleep. 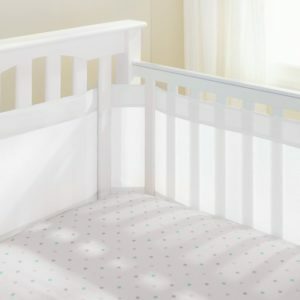 Often a crib bumper is padded and many people feel that it is not safe because a baby can put their face too close to it during the night and not be able to breathe, especially if it is a loose-fitting pad. 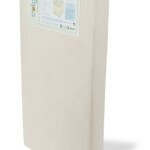 That is why many people choose a crib liner, which is a cloth that wraps around the crib. 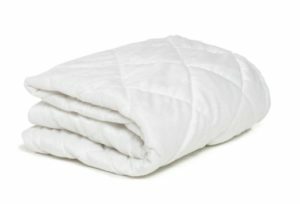 The new crib bumpers and liners are basically the same thing. 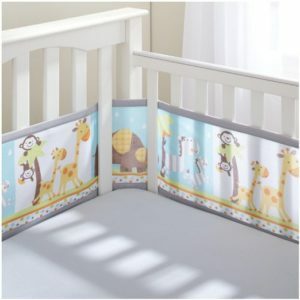 It has no padding to really protect them from bumps, but it ensures that their arms and legs cannot get through the crib rails. 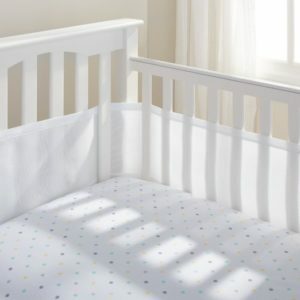 Why Do Some Parents Want Crib Bumpers? Parents do not want to take a chance on their little one getting hurt. 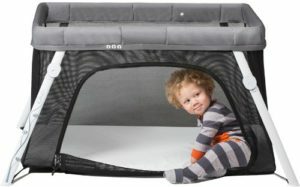 If you choose to go with a breathable mesh crib bumper, you will get a crib bumper that is safe. It is the best of both worlds between safety and comfort. They are safe to use, look great, and keep legs inside of the crib where they belong. If you are interested in the benefits of a bumper pad, but are still concerned about baby bumper safety, check out the breathable, mesh crib bumpers below. They will give you peace of mind as well as prove that there are advantages with covering the slats of a crib. If you do decide that you want a bumper on the crib, we suggest you consider one of the ones below. 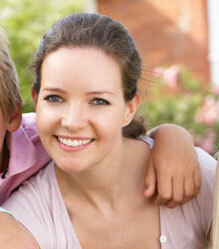 They are all popular choices among parents who trust them to be near their little one. For that reason, we feel that you can trust in them as well. There is something very cool and relaxing about a nautical themed room. It is a style that is kind of preppy, but casually fun at the same time. It can be cute with cartoony whales and other sea creatures or it can be more grown up with anchors and boats. If you want, you can combine the two styles to create one of your own. It is very versatile and regardless of what you choose; it will be a nursery that can grow along with your little man. If you have chosen to stick with nautical crib bedding sets, you may be curious about what decor options you have to go along with it. Some bedding sets give you quilts and valances, some are just the basics. 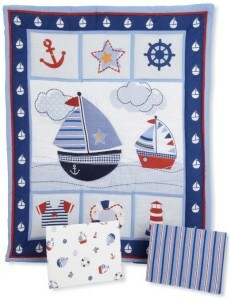 Whichever you choose, decorating around the nautical crib bedding will be easy as long as you have a creative mind. There are toy boxes that are in the shape of a boat, a variety of wall decor that can tie in the nautical theme both in quotes and photos. You can decorate with oars that have your child’s name on it or shelves that are hung using ropes. The ideas are endless and you can look around on the internet and find ideas to make your nursery look different from all others. You can take it as far as you want to, including lights that are anchors and treasure maps on the wall. The biggest thing you must do is decide on a bedding set theme. The rest will simply fall into place. 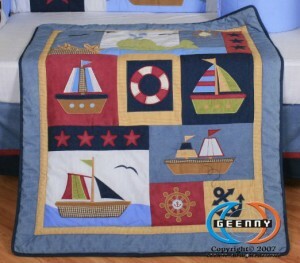 One of the main reasons you should choose the nautical crib bedding sets for boys before you design the nursery around it is to get an idea of what you like the most. Do you like the idea of anchors over whales? Do you want boats that look like they were drawn by a child or would you prefer to keep it more realistic looking? There are a lot of choices for you to make and if you want it all to match up right, you should choose the bedding set first, since, the crib is the focal point of any nursery. 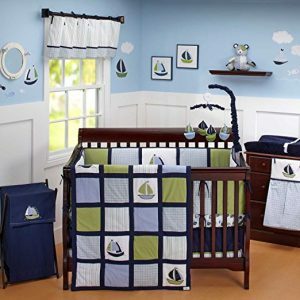 To give you a head start and a few ideas to consider, you should take a look at what other parents have decided is the best nautical baby crib bedding. This will show you what is available and perhaps spark a little creativity within you. There are a lot of choices when it comes to nautical themed bedding sets. Which will become the one you choose? To help you in your decision making, we have put together a few of the most popular sets. They are made of quality material and parents love seeing them in their infant’s nursery.